“What are you making?” asked the woman. I had shopped at this Vietnamese grocery store many times, but it wasn’t until I stood in front of the store’s meat case filling my basket with duck wings, a beef shank, and chunks of bones cut to expose their white marrow that I found myself in conversation. Somewhat reluctantly, I explained to my friendly questioner that I was making a meat stock for soup. Reluctantly, because who was I to speak of soup? I would kneel humbly to get a bowl of pho, the Vietnamese beef noodle soup whose soothing broth is infused with hints of star anise, cinnamon, and clove. On cold wet nights, my family goes out into the rain to get the best pho in the city, at an otherwise charmless restaurant just a few blocks from our house. But their pho is masterful, as much elixir as it is soup. After claiming that she knew nothing about cooking, the woman pointed me to the smallest beef shank in the case. She explained that because of its size it had a greater ratio of tendons to meat. “Delicious,” she murmured, referring to the tendons. After they simmer for a while in my stockpot (otherwise known as the pasta pot) and soften, I will serve the tendons to my gristle-loving husband. He appreciates a chewy experience. I, on the other hand, will be glad of the silky gelatin that will melt from them and put a shine on my soups. A foundation of chicken or meat stock gives soups, stews, and braises a strong start in life. And stock’s soft meatiness helps mellow other ingredients and brings them together into a harmonious dish rather than a mere assemblage. Chicken stock ably lends bland starches like rice and couscous a little warmth and personality. Risottos truly require stock to cohere. And just a few tablespoons of stock revive leftovers. Think of stock as the bass line that holds the music together, or as the candlelight that invites conversation. Really, a carefully made stock is the Barry White of a cook’s bag of tricks. But if the image of Barry White and candlelight does not convince you to take on a six-to-eight-hour cooking process, I have a more practical tip: Don’t set out to make a batch of stock if you are not already planning to do some cooking. Tack stock-making to your list on a weekend day when you're already in the kitchen. Start the stock first, and let it go while you finish your other projects and eat dinner. After dinner, take the stock off the stove and drain it. Let it cool at room temperature in the interim between dinner and bedtime. Right before bed, put it in the fridge. And that's it; the stock has mostly taken care of itself. # Start by filling your stockpot one-half to three-quarters full with bones and meat. Don’t be a miser. If you can’t squirrel away enough leftover meat trimmings and bones, buy some. I’ll explain which ones later, as well as which vegetables. # Add cold water to cover by about three inches. More water than that will dilute the flavor. # Immediately after it reaches the initial boil and you skim off the foam that has risen to the top, turn down the burner to low. The stock should remain at the gentlest of simmers — a mere burbling — for at least 4 to 6 hours. Do not let it boil. # Salt stock only if you are not going to reduce it later. Reducing liquids concentrates the salt. On the other hand, know that adding salt to a stock while it simmers produces an incomparable flavor not easily matched by salting afterwards. Try adding salt if you plan to use the stock exclusively for soups or stews, or for any application where the liquid is not reduced much. Why is it necessary to use both meat and bones? The best path to a rich, full-bodied stock lies in the use of a combination of bones and meat. Meat contributes its juices and characteristic flavor. Bones, cartilage, skin, and tendons are needed for the gelatin they yield. Gelatin is a protein that carries flavor. Gelatin also thickens soups and sauces and gives stocks a softer mouthfeel, making it seem that the broth lingers in your mouth a bit before slipping down your throat. Gelatin is what makes chilled stock look like jelly. Which bones and cuts of meat are best for stock? Not many home kitchens require a steady supply of demi-glace, the classic veal stock that is reduced to an essence and whisked into velvety pan sauces. Stocks are used at home for soups, stews, braises, and the occasional sauce. Whenever you prepare a roast or a stew, glean as many meat trimmings and bits as you can. Save them in the freezer until it’s time to make stock, well wrapped to avoid freezer burn. For poultry or chicken stocks, use any combination of backs, wings, and feet along with hindquarters or drumsticks for their dark meat. To make a poultry stock evocative of chicken noodle soup, throw an entire bird in the pot — the older, the better. Ask at the meat counter for a stewing hen. At farmers' markets, ask for old laying hens where you see eggs and chicken being sold. Beef stock requires beef leg bones and/or veal knuckle as well as a pound or two of meat. Veal bones give stocks a softer, more neutral flavor than beef bones. Augment trimmings with cuts like beef rump, shoulder (chuck), and shank. These parts contain a great deal of connective tissue rich in collagen, a component of gelatin. Many of the guidelines for beef apply to pork, too. Pig feet will make a stock that is notably gelatinous. Never hesitate to ask at the meat counter if you do not see the bones you want. Any butcher worth his or her proverbial salt will be proud to get you bones and parts for a golden stock. If you're not shopping at a specialty butcher or an ethnic grocery store, the bones are usually kept in the back or in the freezer. If the store butchers in-house, chances are it has plenty of bones on hand. If the store buys its meat portioned, the staff can easily make a special order for you. Don’t throw scraps of lamb meat into a stockpot with meat from other animals. Use it only for stocks that are exclusively lamb, as its distinctive taste dominates. As an outraged coworker of mine once said of stock, “It’s food!” She and I were standing over the stock bucket, exasperated by the dirty celery ends, yellowed parsley, and browning carrot peelings that someone had left, intending to be helpful. A stockpot is not a place where compost material somehow becomes edible. Broth is not borne magically of wilted vegetable scraps. 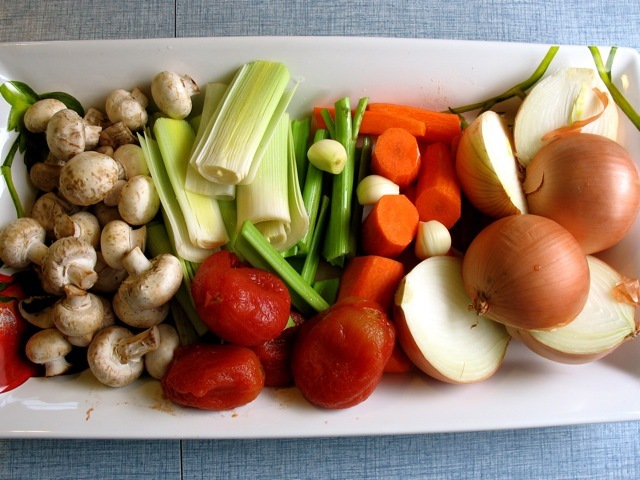 Choose quality vegetables for stock, just as you would for any cooking project, and scrub them well. Yellow onions, carrots, and celery are the foundation vegetables of stock. Use only two to four of each of these, depending on how much stock you are making. They should play a supporting role to the meat. Wash and trim the celery and carrots and cut them in three-inch chunks. Carrots should be peeled. Onions may be peeled or left with their skins on to add a golden color (do trim off the root hairs, though). Cut the onions in half from top to bottom. Which other vegetables, herbs, spices, and liquids you add depends on how the stock will be used. Good candidates include mushrooms, garlic, ginger, lemongrass, apples, leeks, potatoes, tomatoes, wine, black peppercorns, cloves, star anise, cinnamon, parsley stems, bay leaf, and fresh thyme. Avoid cruciferous vegetables — broccoli, cauliflower, cabbage, and the like. These can give your stock a sulfur-like aroma. Bones for beef or veal stock are typically first rubbed with a little oil and salt and browned in a 450-degree oven with yellow onion. Then the fat is poured off and the pan is deglazed with red wine, which also goes in the stock. The result is a stock with rich color and a deeper, sweeter flavor. You may want to try a brown poultry stock. Many people swear by the depth that roasting gives to chicken, turkey, and game bird stocks. Take it a step further and roast the carrots and celery, too. Just be sure to use enough sheet pans to give the bones, parts, and vegetables room enough to caramelize and not steam. Use white wine instead of red. Pour stock through a fine-meshed strainer. Be careful when discarding the stock solids; hot leftover solids will melt garbage bags. Set them aside to cool first. Allow stock to cool to room temperature in a shallow container before refrigerating. If you must refrigerate stock before it has cooled completely, leave it uncovered. Covering warm liquids slows cooling and maintains temperatures ideal for bacterial growth. Skim hardened fat off the surface before using the stock. Store stock in the refrigerator for up to one week. At that point, the stock can be boiled for 3 minutes, chilled, and stored for another 3 days. Freeze stock in small- to medium-sized containers, in amounts that you are most likely to use. Stocks may also be frozen in ice-cube trays and stored in freezer bags, an ideal quantity for sauces. When freezing larger amounts of stock, leave 2 inches between the surface of the stock and the container’s lid. Thaw stock in the refrigerator two days before you need it. When it melts, you’ll have long-simmered flavors at hand, and an ingredient to elevate a dish above the sum of its parts.